This article describes the weekly deliverability report card email that SparkPost sends to it’s users. 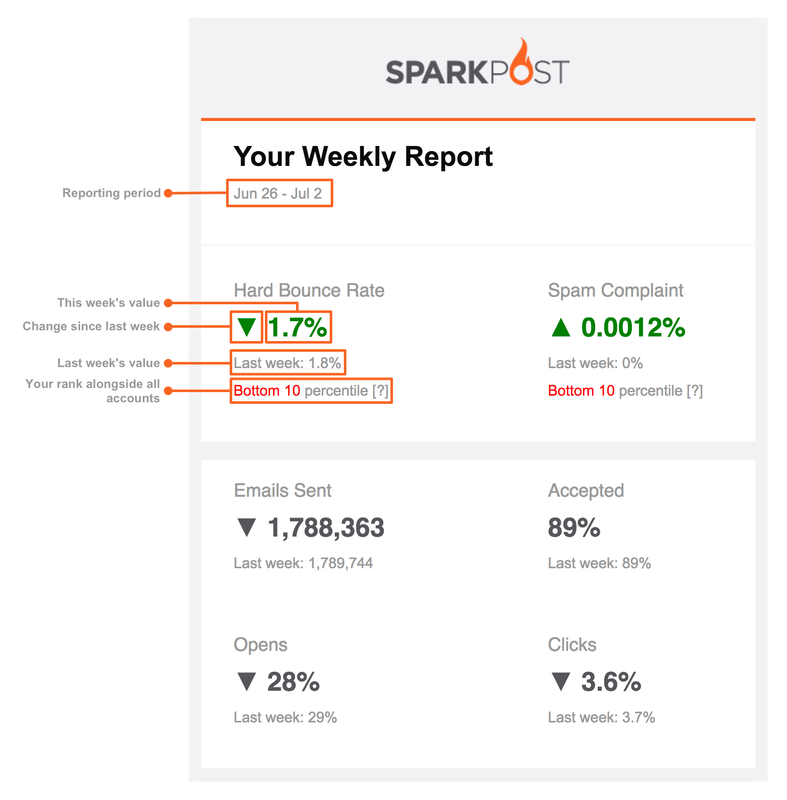 The report provides an at-a-glance weekly review of each SparkPost account with health metrics, usage details and tips on being a better sender. You can also review your account details in the summary report and read about the various metrics here. The report gives details of the previous 7 days sending on your account along with similar details from the 7 days before that for comparison. The health metrics shown in the report are important because SparkPost uses them to assess sending reputation. In extreme cases, SparkPost may warn you or even suspend your account based on these metrics. The report will colour poor health metrics to highlight any issues. Your hard bounce rate is the percentage of your messages that resulted in delivery failures known as "hard bounces". You can read details about how SparkPost classifies the various types of delivery failure in this article. Your spam complaint rate is the percentage of your messages that result in spam complaints from your recipients. The report may show a rank value for each health metric. This section gives your account’s position or "rank" for that metric compared to all other SparkPost accounts. For instance, if your hard bounce rate rank says "Top 10th percentile", then your hard bounce rate is in the top 10% of senders using SparkPost. That is a nice place to be. You can find definitions of all of SparkPost’s metrics here. The SparkPost Deliverability documentation includes details on optimizing deliverability, managing dedicated IPs, IP warm-up and many other tasks related to improving your reputation.